On September 11, 2001 I was a Junior in high school. It was a beautiful early fall day. The sky was so blue and life was just so quietly, perfectly, normal. Junior year was just starting to unfold, at a school that had become home. However, by second period English the world started to change, forever. Literally just a few miles down the road the Pentagon was under attack and just up the Eastern Shoreline of our Great Nation, New Yorkers were fighting for their lives. Years pass and yet I can still so very clearly see moments from that day as if they happened last week. Certain images are etched in my memory and every year they drift through my mind as I continue on with daily life. The courageous people, the tattered flags, the mom at our school saying this was “the real deal”, the announcement by my principle to not drink the water from our fountains as it is a shared supply with DC, not being able to drive our cars home from school – and then not attending for a few days. Cell phones were not working, everyone on TV and the radio was silent, massive highways empty, neighborhoods with the hush of midnight in the early afternoon…. everyones’ faces painted with the mix of grief and awe to be a witness to this surreal time in our nation’s history. And it is true – we would never be the same. As life goes, another beautiful September 11 day was enjoyed in our part of the world last week. The reality of time marching on is like a sound demanding to be heard….. constant, annoying, and distracting – yet on it goes minutes, to hours, to days, to months, to years…… and through it all I come to same conclusion – normalcy, it is a gift. 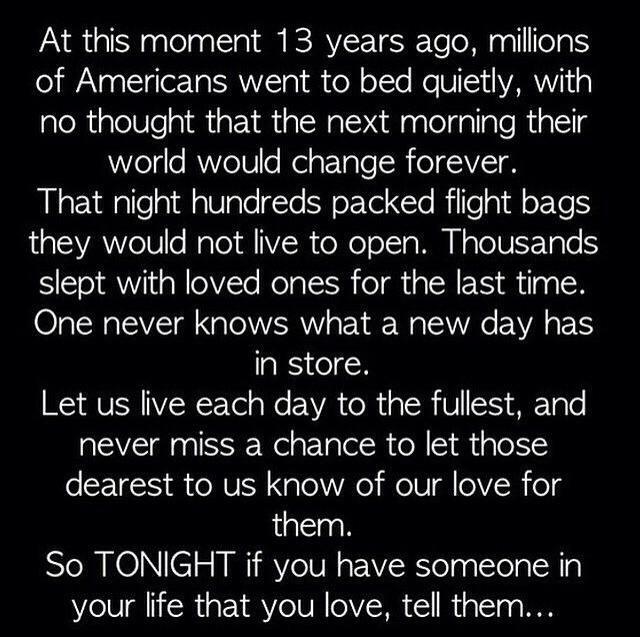 Last night I saw and re-posted this on Facebook – I found it to be incredibly moving. Everyday, all day long, throughout the world – people go through their days, never knowing what is around the corner. For most – just another moment in their life – but for others, it could be the end of life as they know it. Of course we all feel that truth so very strongly when it comes to 9/11 – but it is a reality everyday. This year as I drove around my neighborhood, seeing soccer practices gather, watching parents arrive home from work, people just living their lives I was again overwhelmed by the sheer beauty everyday life provides. Yet for many, there is a hole, there is a missing member of the family, a missing character in the story, a life no longer lived here on earth. There is no question that void is felt when the milestones hit – a Christmas morning that is missing a bright shining face, a thanksgiving table that is missing a seat. However on this day I was struck by the power of the little voids. How many times do you have to put your spouses’ keys back where they go? Do you get frustrated when you have to sift through the junk mail of the many companies attempting to give you new credit cards? Balancing schedules, sharing to dos, insides jokes, simple texts…… then one day those keys will live in the proper basket forever or that junk mail addressed to a Mrs. who no longer has her Mr. Calendars don’t have to be shared, to dos don’t have to be discussed, the joke has lost its origin and those texts will never distract you again….. all the teeny tiny holes throughout the normal day that slowly poke through the fabric of life …. can leave the once pretty pattern of normal life, unrecognizable…. that is what struck me on this 9/11. Normalcy can be overrated, or just a plain myth – but the real heart of the matter is the fact that no matter what is going on in your world, the little life things are still going no too. So when they wear you down, when they distract you, when life feels like a juggling act with no end in sight – do your best to embrace. You never know what life might look like if it all just goes silent. And for those who are still feeling the strong voids of a loss on 9/11 – we pray that memories of everyday life can bring them comfort. God Bless America……9/11 we will never forget.